Teste seus conhecimentos sobre as técnicas de interpretação de texto Skimming and Scanning com o simulado de Inglês do Curso Enem Gratuito. We already know that biometrics could provide some useful new tools for identifying approaching threats or tracking people moving through crowds. But what about checking out books from a children’s library? A Manchester UK primary school is testing out just such a scheme, having children as young as four years old scan their fingerprints as ID for checking books in and out of the school’s library. Not surprisingly, parents and privacy groups have a huge problem with children’s biometric data being so cataloged ― not to mention the precedent it sets. To check out a book, students swipe a bar code placed inside the book at a computer station, which then asks for them to press their thumb on a fingerprint scanner. Books are checked back into the library the same way: no library card or identification required. School officials say the fingerprints are converted to and saved as digital electronic codes that are recognized by the computer, so that no actual fingerprint images are kept on file or shared. Critics of the system, however, find the use of such biometric systems with children so young a breach of privacy and a dangerous overreach by authorities, conditioning children to treat their personal biometric information as something trivial. And it’s worth noting this isn’t the first biometric identifying scheme hatched by UK schools; a fingerprint identifier introduced as part of a cashless school cafeteria system has previously drawn the ire of UK parents who don’t like the idea of their kids being fingerprinted without permission. I. Scanning fingerprints at primary schools has avoided theft of books at libraries. II. Teens had their fingerprints scanned as ID for checking books in and out of the library. III. This new way of checking books can be characterized as a card free system. IV. Fingerprints are kept safe by converting and saving them as digital eletronic codes. V. The biometric system has been criticized because it is the first experience in UK. Language is forever changing – and forms such as tweets and text messages are no less valid than any textbook version, says the linguist David Crystal, whose latest book encourages children to engage with the possibilities of their lingua franca. Were the English language ever to need an official guardian, Professor David Crystal certainly looks the part. But the professor would, I suspect, quickly shrug off such a custodial title – not out of modesty, but principle. Though many endangered languages need their champions, he would say, English does not require a guardian; it is vibrant and evolving and can fend for itself. Crystal’s A Little Book of Language is the latest work of a prolific career. He already has more than 100 books to his name; some are academic but many are for the general inquisitive reader, including By Hook or by Crook: A Journey in Search of English and Shakespeare’s Words, which was co-authored by his son, Ben. A Little Book of Language is a simple history of all language, taking in phonetics, development, social uses, the internet, endangered languages and a touch of literature. He addressed this in his book Txtng: the Gr8 Db8, published three years ago, in which he found that “txt speak” accounted for barely 10 per cent of the contents of the messages exchanged, and noted that abbreviations have always been part of the English language. Having solved that argument with some decent data, he tells me that he’s now moving on to Twitter. The breadth of the internet means that language is morphing not just on grocers’ signs and in school playgrounds, but on a far more fundamental level. there is still a long way to go in this direction. these areas of study have not been successfully linked. one might soon manage to see what is being said. the complexity of language processing is still a mystery. Forget to learn Mondarin before your business trip to China? Just take an in – flight crash course. 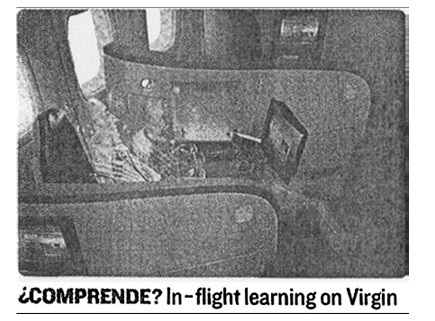 Serveral airlines offer interactive lessons that run on their personalized entertainment systems. Passengers listen, repeat and administrater self-tests. The couses don’t promise to have beginners fluent in 20 hours, but they do hope to save you at least some desperate gesticulating when you land. “We concentrate on words and phrases that can be used immediately upon arrival. “ says Virgin Atlantic founder Richard Branson, whose airline startted offering Spanish and English last August (virgin – atlantic.com) has just launched Berlilitz Word traveler, which offers 11 languages, with plans to add nine more languages by the end of the year. Set up like a game, Word Traveler teaches numbers, dates, simples word and dialogue and gives pronunciation tests. Travelers who finish a couse get a certificate, so you can prove you passed with finish a couse get a certificate, so you can prove you passed with flying colors. o estudo simultâneo de duas línguas. um programa desenvolvido a partir de atividades lúdicas. estratégias de leitura para compreensão de textos na língua ensinada. um prêmio aos que comprovarem 20 horas de estudo na mesma língua. um certificado após a realização de 20 testes na língua escolhida. há diversas culturas no mundo que foram elaboradas para marcar diferenças entre povos, e que tais culturas devem ser respeitadas por todos, pois se tratam de heranças, tradicionalmente legadas de uma geração para outra por meio das quais se garante a identidade e o direito à diferença. há diversas culturas no mundo que marcam as identidades de diversos grupos sociais, mas, com o fenômeno da globalização, estas culturas têm sido ameaçadas, colocando em risco a paz mundial. há diversas culturas no mundo que devem ser compreendidas como algo vivo, dinâmico e essencial para a humanidade. Essas culturas se transformam no tempo e marcam identidades e diferenças, mas essas diferenças não devem significar segregação e fundamentalismo. as culturas devem ser respeitadas, pois são manifestações simbólicas que indicam quem pertence a qual grupo social, sendo a única maneira de demarcar as diferenças entre povos e indivíduos. 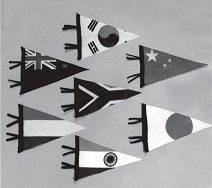 as diferentes culturas do mundo correm o risco de desaparecer, pois, com o advento da globalização, a mercantilizaçao de símbolos tem descaracterizado as culturas como fronteira que estabelece a diferença. Universities are competing to attract the best, brightest and richest12 students. Students who want to obtain their degrees abroad4 have never had more options. For decades, the best5, brightest and richest typically chose6 between Oxford/Cambridge and America’s top universities. No longer. Recognizing the amount of money that foreign students bring, countries including New Zealand, South Africa, the Netherlands and Japan have begun increasing efforts to attract them. With visa1 restrictions and high fees2 creating obstacles for foreign students in America and Britain, other countries are reaching out. The Netherlands now teaches more than fifty percent of its master’s programs in English, and has increased7 recruitment efforts overseas11. In New Zealand, the number of international students jumped from about four thousand in 1999 to more than twenty-one thousand in 2004, with the country earning an estimated $1.2 billion off them. Even Japan is reaching out to nonnative8 students. In 2004, Tokyo’s Waseda University launched3 the School of International Liberal Studies, where a quarter of the students are foreign and all classes are taught9 in English – except Japanese studies. Already three times more foreign students have applied than could matriculate. “This is one way for Japan’s higher education to become globally competitive,” says Dean Katsuichi Uchida. America and Britain are fighting to keep their share of the market. “Continental Europe used to see marketing education as dirty, but schools are starting to say, ‘We have to be more proactive to compete10’,” says B. Wachter, director of the Academic Cooperation Association in Brussels. If they don’t go after foreign students, someone else will. 8/9, p. 54, Aug. 21/28, 2006. Adaptado. “visa” (ref.1) — visto (de passaportes). “fees” (ref.2) — taxas (de matrícula, exames, etc.). “launched” (ref.3) v. to launch — criou, inaugurou. As universidades de Oxford e Cambridge já não se incluem entre as melhores da Inglaterra. O ingresso de alunos em universidades de países não procurados tradicionalmente por estrangeiros teve um aumento considerável na época atual. Todas as universidades que procuram atrair alunos de outros países são obrigadas a ministrar seus cursos em inglês. O número de alunos estrangeiros na Nova Zelândia aumentou em cerca de 500%, em um período de cinco anos. Mais da metade dos cursos de mestrado, na Holanda, são ministrados em inglês. A língua inglesa prevalece no Japão, até nas aulas de estudos japoneses. Older people who lack “health literacy” — that is, they cannot read and understand basic medical information — may be paying a high price. A new study finds that they appear to have a higher mortality rate than more-literate patients. As the authors note, education levels have long appeared to play a role in longevity: one study found that people who did not graduate from high school lived an average of nine years less than graduates. The explanation, researchers have suggested, may be that better education tends to result in better jobs, housing, food and health care. But, writing in the July 23 Archives of Internal Medicine, researchers say that one particular characteristic of a poor education, low reading skills, may alone account for much of the problem. The researchers based their findings on a study of 3,260 Medicare patients over more than five years. At the beginning of the study, the patients were asked about their health and backgrounds and given a health literacy test that required reading and some math. More than 60 percent of the patients were described as having adequate skills. But about a tenth was described as having marginal skills and a quarter as not literate. They were more likely to be older and nonwhite, the study said. In the following years, those with inadequate reading skills were the most likely to die, even when overall education and other social factors were taken into account. The most common cause of death in the group was cardiovascular disease, with a rate of more than 19 percent. The rate for those described as health-literate was 8 percent. Pessoas idosas não devem se automedicar. Idosos de baixa renda apresentam maiores limitações físicas. A acuidade visual sofre declínio com a idade. A maioria dos idosos ingleses morre de problemas cardiovasculares. Habilidades de leitura estão relacionadas à longevidade. 1 Mutuality in recognizing and negotiating difference is crucial for people to deal with their past and 2 the future; it is also essential in the process of creating a culture of responsibility. How can this 3 be achieved and what is the role of art in this process? 4 A vision based on ideologies solves both challenges of sharing – the interpretation of the past 5 and the projections of the future. But ideologies are somehow “total”, if not totalitarian, because 6 there is not much space for serious public negotiation. Individuals, then, lose their integrity or are 7 restricted to their private spheres and, in the end, their memories become part of the dominant 8 identity discourse, their aspirations are delegated. Even in less obvious systems of ideological 9 rule, where individual subscription to the official story line seems to be consciously voluntary and 10 collective memories are willingly encouraged for the sake of collective identities, the negotiation 11 of difference is often not welcome: exclusion happens quickly and non–conformist doubts produce 12 suspicion. 13 A democratic vision – shared aspirations for the future, based on negotiated interpretations of 14 the past that respect diversity – is necessarily found in complex processes of private and public 15 discourse and participatory and inclusive culture. Yet, politics tends to reduce complexity and 16 engineer the balance between the individual and the collective rather than invest in processes of 17 negotiation. We have learned, though, that this social engineering is a phantasm, largely limited18 and limiting, and, even if successful, often creates paranoid and fatal structures of homogeneity 19 by trying to mould memories and hopes. 20 Humankind has gathered impressive knowledge about the limitations of the human will and 21 the failures of such “engineering”. Nevertheless, despite this, and maybe even because of it, 22 we cannot give up trying the impossible: to create conditions for equality and solidarity for 23 individuals to flourish. These conditions should be accompanied by narratives of a just, fair and 24 free commonwealth of all. If history and memory seem to make this dream an unlikely scenario, 25 can art play this part? 26 The role of art is precisely to keep inspiration alive, to deconstruct ideology, to recall the necessary 27 dream of freedom, of the individual and of the common good beyond the “either/or” and beyond 28 simplicity. In this sense, art in general prevents false hopes, and thus generates hope in the most 29 paradoxical way: the only way of hoping that reaches beyond the private sphere without some 30 kind of ideological distortion. 31 What makes art so unique? And why? Because the best narratives of art are purpose‑free, 32 uniquely non‑instrumental, simply human. Art narrates what we don’t understand in enlightened 33 ways. Artists in particular offer a wealth of unseen perspectives and unexpected pathways of 34 human exploration. Art makes us aware that all memories are personal, despite the power of 35 collective narratives. Arts and culture empower people to think freely, to imagine the unimagined, 36 to feel responsible across borders and boundaries. Hopefully, the narratives of the future will be 37 intercultural – and art will be the ally in the art of difference that needs to be further developed. 38 “Art is about difference, art is difference”, as stated by Igor Dobricic*. And it is difference that will 39 be at the origin of the new bonding narratives of confidence. The punctuation mark called dash, in the fragment above, signals the introduction of an explanation. Encontram-se em destaque cinco termos ou expressões. Assinale a alternativa correspondente ao termo cujo emprego está INCORRETO. I am currently studying for a PhD at the British Antarctic Survey working on the structural interpretation of gravity and magnetic going from east Antarctica, including both numerical and mechanical modelling of data. MICHAEL D. COE’S Breaking the Maya Code. Revised paperback edition. First published 1992. Thames & Hudson, New York, 1999 ($18.95). 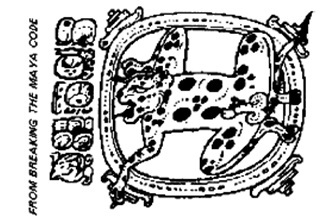 The decipherment of the Maya script was, Coe states, “one of the most exciting intellectual adventures of our age, on a par with the exploration of space and the discovery of the genetic code.” He presents the story eloquently and in detail, with many illustrations of the mysterious Maya inscriptions and the people who tried to decipher them. Most of the credit, he says, goes to the late Yuri V. Knorosov of the Russian Institute of Ethnography, but many others participated. They did not always agree, and some of them went up blind alleys1. includes details of the disagreements among scientists in the decipherment project. is co-authored by the Russian ethnographer Yuri V. Knorosov. revises the author’s previous interpretation of Maya inscriptions. is to be followed by a book about the Mayas’ misfortunes and achievements. has been highly successful among anthropologists and other academics.